Does anyone seriously think Zimbabwe can be brought back to health and democracywithout the acknowledgement of historical atrocities, asks Omry Makgoale. 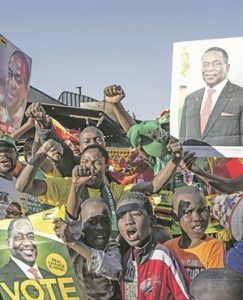 Elections in Zimbabwe appear to have been free and fair, according to observers, but the vote counting has not been satisfactory to the opposition parties. Nelson Chamisa and Tendai Biti, leaders of the Movement for Democratic Change, have claimed that the vote counting was fraudulent. Emmerson Mnangagwa, the incumbent as head of the ruling Zanu-PF since his coup against Robert Mugabe, has suggested that those who are unhappy with the voting and the counting of votes should approach the courts for arbitration. As Mnangagwa ultimately assumes the highest office through elections in Zimbabwe, his rise must be reviewed. Mnangagwa became the military right-hand man of Mugabe after the assassination of Josiah Magama Tongogara, the commander of Zanu-PF’s army Zanla during the liberation war waged from Mozambique. After the Lancaster House Talks at the dawn of the new Zimbabwe, Tongogara is said to have proposed to Mugabe that, for the sake of unity, he must work with Joshua Nkomo, the leader of the Zimbabwe African People’s Union (Zapu), who was then called the father of Zimbabwe. The suggestion that Mugabe subordinate himself to Nkomo was a fatal mistake. Mugabe was not impressed, leading ultimately to the elimination of Tongogara by assassination in Mozambique on December 26 1979. This marked the turning point between Zanu-PF and Zapu-PF after the initial artificial unity under Zanu-PF, which was like the unity of water and oil. These were tribalist liberation movements, with Zanu-PF largely Shona speaking and Zapu–PF largely Ndebele speaking. It is known that the Shonas in Zimbabwe are still begrudging the Ndebeles and their king Mzilikazi ka Mashobane for having invaded and taken the western part of Zimbabwe in 1840. The tribal hostilities are still glaring today. After Zanu-PF won the elections in February 1980, some Zapu-PF members harboured taking over power by military means in what would be the October Revolution Zimbabwe-style. It was these rumours that angered and agitated Mugabe, together with Zanu-PF. In response, Mugabe recruited young Shona men and invited North Korea and Mozambique to train them as part of a unit named the Fifth Brigade. After the completion of training, the brigade was deployed in Matabeleland under Colonel Perence Shiri (now minister of land) and Mnangagwa. They applied scorched earth tactics, murdering thousands of Ndebele people – men, women and children, but especially men – in trying to exterminate Zapu, in addition to imprisoning its military leaders Dumiso Dabengwa and Lookout Masuku. Mnangagwa, nicknamed “The Crocodile”, was riding over Matabeleland like a colossus. Does anyone seriously think Zimbabwe can be restored to health and democracy without acknowledgement of these historical atrocities? How can Zimbabwe achieve peace without its own version of the Truth and Reconciliation Commission? Only time will tell. Considering that Mnangagwa was trained in China under Mao Tse-tung, maybe he should be given the benefit of the doubt. After the death of Mao, Deng Xiaoping took over. Like his predecessor, Deng was intolerant of any form of democracy. He demonstrated his intolerance by mowing down students at Tiananmen Square in June 1989, carrying out a massacre of immeasurable proportions. Maybe Mnangagwa, after presiding over the Gukurahundi massacre, can learn from his Chinese instructors and bring the necessary reforms to Zimbabwe, saving the country from economic meltdown. He might thus restore the breadbasket of Africa. Is Zimbabwe still stuck in the gloomy past or is it in a new dawn? Only history will tell. With regard to the ANC, it has not been consistent in dealing with the Zimbabwe issue. The party was silent during the Gukurahundi massacre; it failed to condemn these senseless killings of the innocent in Matabeleland. All in all, it was said that the ANC in exile was begging to get access to the Limpopo River in order to carry out operations in South Africa, hence avoiding antagonism of the ruling Shona-controlled Zanu–PF. It has continued to be silent about the deaths of so many Ndebeles to this day. Truth, morality and human solidarity were sacrificed to get access to the Limpopo River; very sad indeed. This is the cruelty of war – that we close our eyes and pretend that nothing wrong is happening when people are slaughtered. As a matter of principle, the ANC must never support tribal liberation movements. For the nation to survive, the tribe must be subordinated to it. These are the teachings from Pixley ka Isaka Seme and other founding fathers of the ANC. It is as true for Zimbabwe as it is for South Africa. We must remember these teachings and act on them now. There is no way Zimbabwe can avoid killings and dictatorship without courageously facing the facts of its history. Zimbabweans need honesty and truth from the ANC, not servility in the face of a history of tribalism and massacre.